This weekend many of London’s streets will fill with crowds of enthusiastic supporters cheering on their friends and relatives as they run (or walk!) that gruelling distance. It’s a test of energy, of fitness and of courage in the face of testing conditions. Let’s hope the weather is on their side! The idea of a Marathon comes from the legend of Pheidippides, a Greek soldier who fought in the great battle against the Persians near the small town of Marathon in Greece over 2,000 years ago. The victory was won and the news had to be taken to Athens. No phones or telegrams available! Pheidippides was ordered to run the 26 miles to Athens to deliver the message. He made it. If you’re feeling inspired to have a go at a marathon yourself, In London or elsewhere, make sure you plan ahead and start your training well in advance. To help you, we’ve put together top tips from a serving Officer in the Army’s Physical Training Core. Run like a clock. If possible, run at the same time of day that your marathon will take place. It’s the best way to make sure your body’s rhythms, including the all-important bathroom routine, will be in sync come race day. Mimic the course. Where possible, start doing runs on the same kind of route as the marathon. For example, go up and down hills if you’re running a hilly marathon, or get used to several hours of pancake flatness if you’re running a level course. Do a half-marathon. 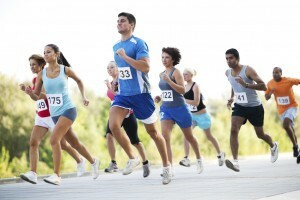 About a month ahead is a great time to test your fitness by running a half marathon. Just remember to take a rest period in the few days before and after the event, to relax first and then to recover and let your muscles build. Don’t be greedy. Training for a marathon isn’t like cramming for an exam. Doing many more miles in the last few weeks will hurt, not help. Draw strength from the hard work you have put in and be confident in your programme. Do a rehearsal run. Four or five days before the marathon, do a two or three-mile marathon-pace run in the shoes and outfit you intend to wear on the day. Picture yourself on the course running strong and relaxed. Taper your training regime. Do no more than 40 percent of your peak weekly mileage, with most of that coming early in the week. Except for your dress rehearsal run, keep your runs easy. Carbo-load, don’t fat-load. During the last three days, concentrate on eating carbohydrate-rich foods, such as pasta, potatoes, bread, fruit, fruit juice, low fat milk and yogurt, low fat treats, and sports drinks. Its carbs not fat or protein that are the essential fuel on race day. Drink on the run. Practice during your remaining long and semi-long runs with sports drink and energy gels you will use during the race. Remember that sports drinks provide fluid, carbohydrates, and electrolytes – the most important being sodium. Dress for the part. You’ll run much more easily in specialised running wear, such as those made of Coolmax or nylon. Avoid 100% cotton clothing which soaks up the sweat and leaves you feeling restricted. Make sure you have a good pair of running soes that have been used enough to be comfortable. Visualise success. Before going to bed, or first thing in the morning, imagine yourself crossing the finish line as the clock shows a new personal best. It’s you and you have done it – your friends are cheering! Positive mental images and reinforcement will help during the tough times. Eat breakfast. Two to three hours before the start of the race eat a carbohydrate-rich breakfast, even if that means getting up an hour early and going back to bed. Aim for a few hundred calories, such as a bagel and banana or toast and a sports bar. Collect and focus. An hour before the start, find a quiet spot and spend five minutes reviewing your race plan and motivation. Remind yourself of why you’re there, take confidence in all the training you’ve done. An exciting and satisfying day is just ahead of you! If you’re running the race with a training partner, make it a group session. Warm up but not too much. Even the best marathon runners in the world do just a little jogging beforehand, because they want to preserve their glycogen stores and keep their core body temperature down. Get loose. Fifteen minutes before the start, begin some gentle stretching. Remember, your goal is to start the race comfortably, not to audition for a yoga video, so go easy. Jog in place as well to keep your heart rate slightly higher than resting state. Relax at the start. If the pace feels easy initially – that’s a good thing, don’t push it. Just remember to stick to the game plan. Race the event you have trained for, it’s easy to get carried away with the crowd and initial support. Start slow, speed up later. Run slightly slower than your goal pace for the first two to three miles. No matter how much you’re raring to go, keep things under control until well past the halfway mark. Then you can start pushing the pace. Drink early and often. Take sports drinks at the first aid station and every one after. Don’t imagine you will know when you are dehydrated, it’s not so obvious as you might think. Taking in carbohydrates and fluid early will help postpone or prevent serious dehydration or carbohydrate depletion later. You made it! We hope these tips are helpful. Let us know if you’re running, this weekend or any time, and how it was for you.